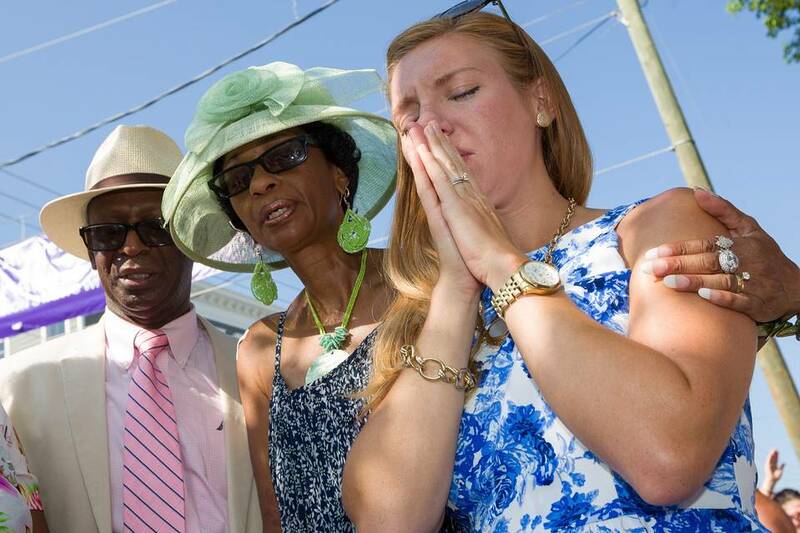 Critical Thinking: Is Charleston Burning? But, there has been major progress in the South. Dr M L King said "the South will solve its race problem long before the North." In the South Blacks and white have lived next to each other forever, and most white babies were suckled by Black nurse maids. And Sunday morning is no longer the most segregated time of the week. "The doors of the church are open," declared the Rev. Norvel Goff during prayers. "No evildoer, no demon in hell or on Earth can close the doors of God's church," he proclaimed. 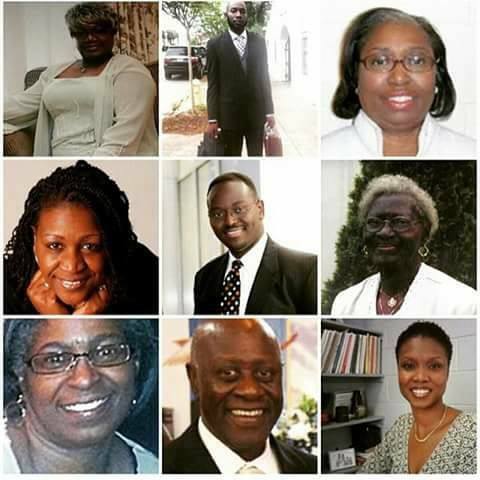 One of the victims was the church's pastor, the Rev. Clementa Pinckney. His seat behind the podium was shrouded in black cloth and uniformed police officers were present in the side aisles. "It's by faith that we are standing here and sitting here," Goff said. "It has been tough. It has been rough. Some of us have been downright angry. But through it all God has sustained us." (1) The Rev. Clementa Pinckney, 41: A state senator and the senior pastor of Emanuel, he was married to Jennifer Benjamin and the father of two children, Eliana and Malana. He was a 1995 graduate of Allen University and got his master's degree at the University of South Carolina in 1999. He served in the state Legislature starting in 2000; The Post and Courier says black fabric was draped over Pinckney's Senate chamber seat on Thursday. I believe Senator Clementa Pinckney was the real target of the assassin. The other eight were collateral damage designed to coverup a political assassination. Pinckney became even more influential through his work as a legislator, pushing several causes -- like recently advocating for legislation to make police wear body cameras, believing it would protect lives, according to his cousin, state Sen. Kent Williams. "I think that if my colleagues will be moved by the fact that other people are moved by the need for body cameras, and also that there will be persons that will give testimony as to why body cameras are important,” he said. “Body cameras help to record what happens. It may not be the golden ticket, the golden egg, the end-all-fix-all, but it helps to paint a picture of what happens during a police stop." (2) Cynthia Hurd, 54: According to the Charleston County Public Library, she was a 31-year employee who managed the John L. Dart Library for 21 years before heading the St. Andrews Regional Library. A statement said Hurd "dedicated her life to serving and improving the lives of others." The system closed its 16 branches Thursday to honor Hurd and the others who died in the shooting. County officials also say the St. Andrews library will be named for Hurd. (3) The Rev. Sharonda Coleman-Singleton, 45: A pastor at Emanuel, she was also a speech therapist and high school girls track and field coach, both positions at Goose Creek High School, according to her LinkedIn page. Jimmy Huskey, the school's principal, called her "a true professional ... [who] cared about her students and was an advocate for them." Her son, Chris Singleton, is a baseball player and student at Charleston Southern University. Coleman-Singleton also had two younger children, writes the Post and Courier. (4) Tywanza Sanders, 26: He was a 2014 graduate in business administration from Allen University in Columbia. Lady June Cole, the interim president of Allen University, described him as "a quiet, well-known student who was committed to his education." Known as Ty, he had worked in sales at department stores such as Belk and Macy's. (5) Ethel Lance, 70: She had attended Emanuel for most of her life and worked there as a custodian, as well. From 1968 to 2002, she worked as a custodian at Charleston's Gaillard Municipal Auditorium. The Post and Courier quotes a former colleague as saying, "She was funny and a pleasure to be around. And she was a wonderful mother and grandmother." (6) Susie Jackson, 87: Lance's cousin, she was a longtime church member. (7) Depayne Middleton Doctor, 49: The mother of four sang in Emanuel's choir. She had previously directed a community development program in Charleston County. In December, she started a new job as an admissions coordinator at the Charleston campus of her alma mater, Southern Wesleyan University. SWU President Todd Voss said: "Always a warm and enthusiastic leader, DePayne truly believed in the mission of SWU to help students achieve their potential by connecting faith with learning. Our prayers go out to family and friends. This is a great loss for our students and the Charleston region." As American as Apple Pie. VIOLENCE! Four Black girls in Black church killed in 1963. 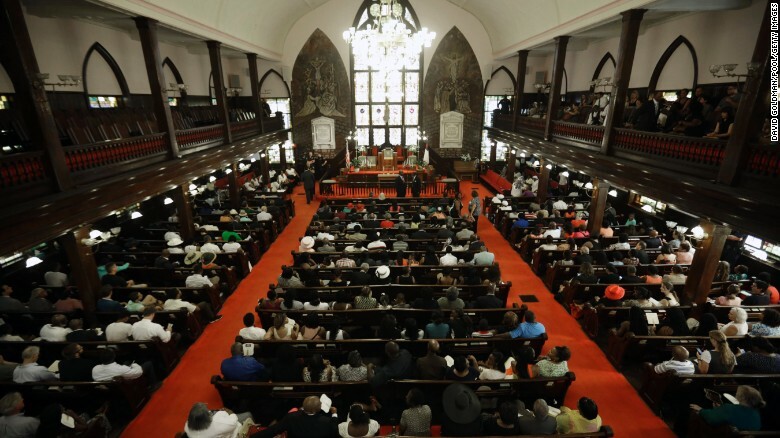 Nine Black men and women killed in Black church in 2015. What has changed? It was a bomb in 1963. It was a gun in 2015. America has a history of violence. The 16th Street Baptist Church bombing was an act of white supremacist terrorism which occurred at the Black 16th Street Baptist Church in Birmingham, Alabama on Sunday, September 15, 1963, when four members of the Ku Klux Klan planted a minimum of 15 sticks of dynamite attached to a timing device beneath the front steps of the church. 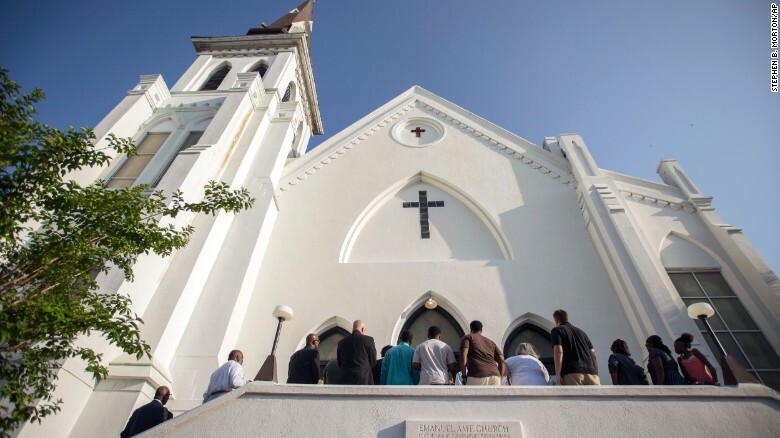 Nine people were killed at a historic Black church in Charleston, South Carolina, Wednesday, June 17, 2015 when 21 year old Dyland Roof, a white gunman, opened fire on a prayer group that he had sat through for over an hour. Dylann Roof is the Charles Manson of this generation. Helter Skelter. Helter Skelter is supposed to be an apocalyptic war arising from racial tensions between blacks and whites. It appears that this was his motive. 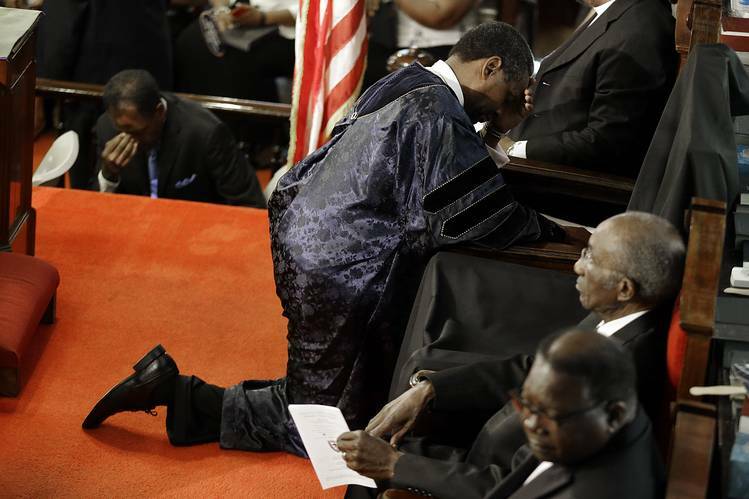 He struck at the heart of the Black Community, that is "The Black Church and the Black Conservative Christians". If the Black Community is to survive and over come, it will be through the efforts of the Black Conservative Christians. Whoever trained and unleashed Dylann Roof knew this. He plunged a dagger into the heart of the Black American Community.